Not to be confused with Aquarius (constellation). The water carrier represented by the zodiacal constellation Aquarius is Ganymede, a beautiful Phrygian youth. Ganymede was the son of Tros, king of Troy (according to Lucian, he was also the son of Dardanus). While tending to his father's flocks on Mount Ida, Ganymede was spotted by Zeus. The king of gods fell in love with him and flew down to the mountain in the form of a large bird, whisking Ganymede away to the heavens. Ever since, the boy has served as cupbearer to the gods. Ovid has Orpheus sing the tale. Aquarius is a winter constellation in the northern hemisphere, found near Pisces and Cetus. It is especially notable as the radiant for four meteor showers, the largest of which is the Delta Aquarid meteor shower in late July and early August. "Aquarius". Oxford Dictionaries. n.d. Retrieved December 23, 2018. 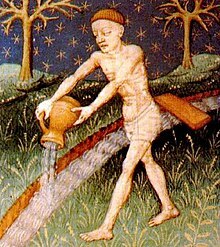 "The Aquarius Myth – The Story Behind the Constellation Aquarius". Gods-and-monsters.com. January 14, 2015. Retrieved February 6, 2015. "Pisces". Oxford Dictionaries. n.d. Retrieved December 23, 2018. Wikimedia Commons has media related to Aquarius (astrology).